Vegetables are really important to your nutrition. But are you getting enough peas? Last night on Iron Chef America, the secret ingredient was…FROZEN PEAS! Oh my God! My favourite standby vegetable in every situation. Making a noodle dish with sauce, meat and noodles? Make it more nutritional by throwing in PEAS! 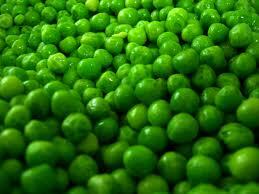 Frozen peas are wonderful to have on hand for those people who do not like carrots, broccoli, salad, etc. Frozen peas are essential to chicken-a-la-king and other traditional meals. NO MORE canned peas! Fresh are best but if you grow them they almost never make it out of the garden because you or your kids are eating them out of hand or you used them in a stir fry as pea-pods – mmmmmm – pea-pods. They add colour to fried rice and can be blenderized into a spectacular soup. I mentioned in my last blog (by the way, my knee is much better and no more of the “gee I wonder” pills) that I iced my knee with the medicinal peas. It has long been a tradition in my house, and supported by physiotherapists everywhere, that we have a bag of frozen peas labeled “Medicinal – Do Not Eat!, in our freezer. They work! Just don’t leave them out for a couple of days. Peas have many uses and are wonderfully flavourful as well as being full of vitamins. They are a humble veggie so… as John Lennon once said, “Give peas a chance!”. Thanks for listening. ;D Diane – Hoping for whirled peas. ~ by 1fatgirlshrinking - Diane Kirby on January 19, 2012.